They say a house is a true reflection of oneself. How true indeed. Other than revealing the style we've incoporated into our house, I am also ashamed to admit the amount of clutter we have accumulated over the years. Before marriage, it was just a roomful of things and a suitcase packed to my new home. I have lost count of the number of boxes I have packed, half of which are things that I have no inkling clue of the last time I saw or touched it. I am only glad I've managed to sell off some furnitures and appliances to make space for the temporary smaller place we'll be holding up at for the next 2.5 years before our EC is ready. Some asked why did we not consider buying a readily available development - well, with the current ever-rising prices, it takes alot of courage to sign your name under that large mortgage loan. We were actually thinking longer longer term. Hopefully, we can use this 'mortgage-free' period to accumulate our CPF savings and invest in a 2nd property in future. :) Hopefully. Ok back to the our house. Dylan has been urging me to pack since the day we sold our house. So kan cheong spider. I hesitated for quite a while. Not because I was lazy to pack, but I was overwhelmed with emotions. After all, this is the first home I've owned, built, decorated and have had lots of memories in it. Saying goodbye was not that easy. I started to re-collect the times where we went around house-hunting - covering places from the North to the East almost every weekend. 35 houses, we viewed 34 houses before we were satisfied with the 35th one. And the ironic thing was we wanted to find a house which was very much in its raw state from HDB. Alot of places were nicely decorated but it wasn't our style. We wanted to over-haul the entire place. 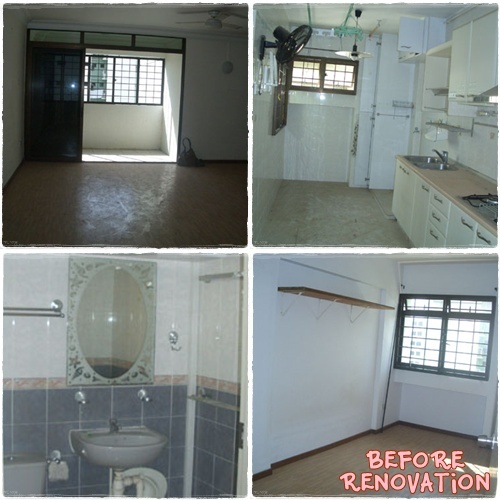 So, we thought finding such a place was almost impossible, cause who wouldn't renovate their house right? Well, no. 35 house proved us wrong. The place was as raw as it can get. Almost zero renovation done except for the kitchen cabinets. PERFECT. We even managed to seal the deal 30k below valuation. Where to get such deals these day right?!? My last words to my beloved home (I know very cliche) - You've provided us good shelter and ample space throughout these years. You have also kept our friends comfortable and made every gathering enjoyable and memorable. Thank you for bringing us warmth and I hope you'll be happy with your new owner. I'm sure they will continue to keep you clean and tidy. Farewell my humble abode. i'll miss it too! we had so much fun gatherings there! !